Ah, the holidays. Is there anything more fun than giving someone homemade cookies? Okay, well, handing out a million dollars might be more fun but I’m guessing many of us are on a homemade cookie budget for our friends, family and colleagues. That’s why I made you a list of ideas for packaging cookies. Sure you can put cookies on a limp white paper plate that you bought in bulk at a superstore and wrap the plate in plastic wrap but you put a lot of thought into your baking right? So step up your packaging game. Think about the cookie that you’re packaging in determining what to use. Have you spent four days cutting out sugar cookies and creating elaborate royal icing decorations on them? Then certainly incorporate a clear package so that your artistry shines and becomes part of the gift itself. Think over-sized clear cellophane bags or a large wide-mouth mason jar or a pastry box with a clear window. Have you baked a delicious batch of drop cookies that look a bit plain Jane? Perhaps tuck those into a colorful cookie tin. Are the cookies going to your best friend? Find a cookie jar that matches the decor of her kitchen or her office! Who doesn’t want a cookie jar at work? Are these treats destined for your child’s teacher? How about a small holiday printed card box that the teacher can simply toss after consuming the goodies. 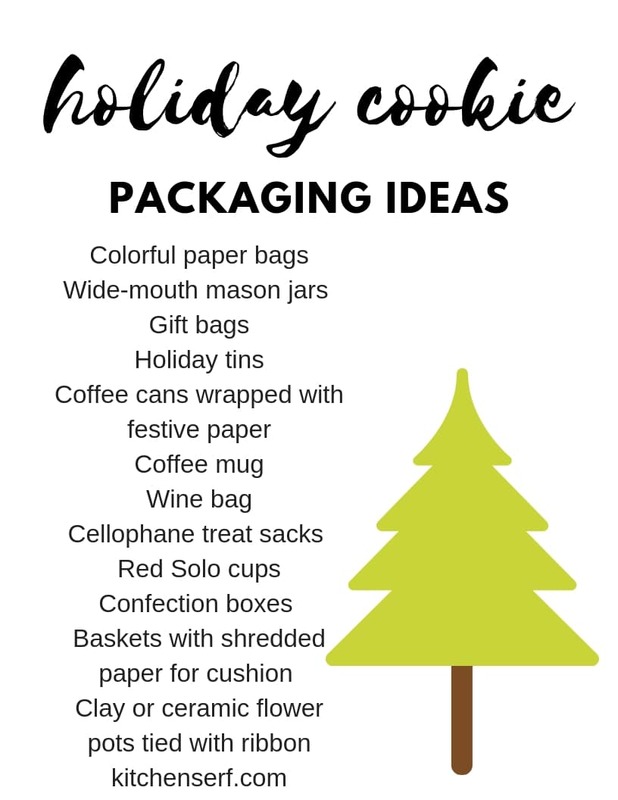 Where to Shop for cookie packaging supplies? You can find these supplies at numerous places, including drug stores, kitchen supply stores and even grocery stores. Don’t forget to add layers and clusters of tissue paper or colorful paper “shreds” to line your package and up the festive factor. Download this list to print out and put on your fridge or anywhere you might need a reminder. How do you package cookies for gift giving?